Richard came through the academy and made his debut for the Hornets in March 2003. He left for a season on loan at Blackburn Rovers in 2005 before returning a year later, mostly as back-up to Ben Foster, Mart Poom and Scott Loach. He finally joined Brentford in 2010. Watford Legends spoke to Richard in 2011. Hi Rich. Thanks for talking to Watford Legends. How did you become a Hornet? I was about ten I think and I was playing for a team in Aylesbury, Bedgrove Dynamos, and there was a centre of excellence at Quarrendon gym. The manager of Bedgrove Dynamos was also a scout and the majority of our players at the time had trials at some point with Watford. I remember the first trial session we had and there were about 70 kids at this trial game including five keepers and luckily they kept me on. That was how it all got started and after that I started coming to training with Watford more regularly. Progressing from that ten year old up through the ranks and into the reserves and then the first team, how confident were you of making it in the game? It was a good time for me but I never really felt like I was one of the key players if you like. I had a few challenges along the way. At one point Lee Grant, who is now at Burnley, was my main rival for the spot. All through my time there were challenges for my position but I always managed to stay just ahead. I always remember when I was 16 and I was the first to get offered the apprenticeship. It was only then that I really believed and thought that I had a chance at this. In a way I stumbled into it. Being a footballer was always something that I wanted to do but it was only at 15 or 16 that it dawned on me that I had that opportunity. So I started my YTS and had a good year. I was fortunate at the time to have Jimmy Gilligan as my manager and I knew he rated me. It’s always nice to know that the manager has got your back and he wanted me to progress. I remember the day we got pro deals; there were eight of us in total. As well as myself there was Lloyd, Sam Swonnell, Barry Matthews, Simon Patterson, who is sadly no longer with us, and a few other lads as well so it was a really successful year. It was Preston at home on a Tuesday night. There is a bit of a story behind that question! At the time the goalkeeping coach was Kevin Hitchcock. As a kid I was very strict on myself and would very rarely go out clubbing or drinking or anything like that. I was completely focussed on football. The Saturday before the game Neal Ardley took me under his wing and was harassing me to go for a night out and a few drinks. I was only a young lad but I went along and we ended up having quite a bit to drink. Needless to say I felt rough on the Sunday! Normally if I ever done that then Hitchy would have been fine, he wouldn’t care about something like that. I remember though that this time he was moody with me and i couldn’t work out why. I was still feeling a bit ropey on the Monday as well probably because I didn’t do it that often! I now know, with hindsight, the reason Hitchy wasn’t happy with me doing it was because he knew I was going to get the game on the Tuesday. In fact we were in this very hotel (Hilton, Watford) when Ray Lewington pulled me to one side and said ‘you’re playing tonight’. The first thing I did was call my friends and family but behind my back Hitchy had already done that so that everyone had plenty of notice and could be there, I think my dad managed to organise a box for the night! I’ve never been as nervous as I was in that two hours or so leading up to the game. As for the game itself I remember I had a few nervy moments in the first half but in the second half I calmed down, grew into it a bit and came out with the man of the match award. It was great to make my debut but I didn’t sleep a wink that night! I also remember Dychey got sent off after about 15 minutes. That must have helped you on your debut, your centre half getting sent off early on! With it being Dychey it probably did help as it meant I didn’t have him in my ear through the game! In all seriousness though I was just focussed on my own performance that night. They went one up through a penalty which I went the right way for but it went through me. The second half I had a bit more to do. I also had one of those horrible moments when one went through my grasp but luckily for me it went over the bar. I went on to have a decent game and played a few more that season. You have been unfortunate in that during your Watford career there have been some top class keepers at the club such as Loachy and Foster who have both gone on to have involvement with the England squad, and of course you have played under Chamberlain as well. Do you feel that Watford is a good school for keepers? Chambo has been huge for me; I have known him since I was 13 years old. Peter Bonetti used to come in and take the keepers so I got to know him as well. And there was Kevin Miller as well of course. But Alec has probably been the most influential to me. I still speak to him often and even tonight we have exchanged a few text messages. Looking back at my time it was a mixture. Obviously Foster is a fantastic keeper and Loachy is going to go to the top. A couple of times though I shot myself in the foot when I was playing well and then for whatever reason my form dropped and I lost my place. Looking back I should have played a lot more games than I did. How do you rate Loach compared to Ben Foster? They’re different types of keepers. When Ben was the age Loachy is now he had barely played any games as he progressed a lot later. With the level that Loachy is at given his age he has got a great chance. I do think that maybe now is the time he needs to kick on again soon though and take it up a level. He has some great attributes; he kicks well, he is a good size and he has a great presence about him and I think as time is going on he is using that more and more. The question now is to whether he can do it at the very highest level. With Ben I think what he had over me and Loachy was that natural dominance. He is a big lad, very powerful and in some ways he was quite raw when he was here. He played without a care in the world and really dominated his box and I think that is what Scott should aspire to. At a lot of clubs it tends to be the case that the number two will hardly ever get a first team game but with you and Foster you did get a few more games than the average number two. Do you feel you deserved to play more games though? I’m not one to shift the blame but I do feel I was unfortunate. I was playing ok the season following my debut and then I broke my arm and Lenny Pidgeley came in. The following season was great because that really felt like the breakthrough season for me. We got to the semis of the league cup, I was playing regularly and we were doing well when I broke my cheekbone up at Coventry when James Chambers’ knee caught me as we both went for the same ball. It couldn’t be helped at all so I have no regrets but I did feel as though I was on top of my game at that point. When I came back from that I wasn’t right and that was more mentally than physically. My game has always been about speed off my line, bravery, one on one’s etc. But when I came back I wasn’t quite the same. I had been training with a mask on but I just wasn’t right. Aidy came in and I was in the midst of this period of knowing I wasn’t right mentally and also my knee was ready for an operation. I couldn’t get myself as confident as I was earlier in the season. It probably didn’t help that the team were doing poorly. I was actually quite thankful when I was pulled out for the last few games to have my op and Alec took over for the last few games. That is something you learn from though because if that confidence crisis happened again now there would be every chance I would pull myself out of the team. The following season I went to Blackburn which again I don’t regret. Aidy had come in and Ben Foster was always coming in as number one so I had to get myself out really and I got the opportunity to go up to Blackburn. It was a shame I was never really given the opportunity in that year to show what I could do though I guess I did ok as they did try and buy me, but the clubs were so far apart on their valuations it was doomed from the start. That surprises me. The way I saw it, Aidy didn’t fancy you so if Blackburn made a bid for you and Aidy didn’t want you, why didn’t the move happen? Well that was the cause of our first argument to be honest. You are right in that Aidy didn’t fancy me so when Blackburn came in it was a dilemma to stay where I am not wanted as a number two, or go to a Premiership club as a number three and try and fight my way in. The year itself was fine and I did ok in the reserves though I never really got near the first team. I came back and I was in touch with Mark Hughes and with Kevin Hitchcock and they kept assuring me that they were trying to buy me. It started when I went there on the last day of the transfer window. They couldn’t agree a fee so it was actually me that suggested to Hitchy that they loan me so I could get out and then they could sort out a fee further down the line. I was concerned about my career stalling completely so I was keen to get it sorted. In the end they did the loan deal with the option to buy me at the end of the season for something silly, it was around about £1 million. Come the end of the season Blackburn went to Watford and said that they did want to take me but not for a million. They offered a few hundred thousand but Watford dug their heels in and wouldn’t let me go for less than a million. I kept speaking to Mark Hughes and he kept reassuring me, but when I was on holiday I remember hearing that they had signed Jason Brown. I thought that would be the end of it but they still told me they wanted me. I also had it in mind that I might be able to have another go at Watford. I remember getting a bit of press for it at the time as that summer I went and bought a load of footballs and went to the park to practice my kicking. I practiced and practiced as one of the first things Aidy told me was that I had to be able to kick it a mile if I wanted to be his keeper. So long story short, I went back to Watford and thought I would train and see how it went. On day one we had a practice match. At one end was Loachy, who was only about 18 at the time, and at the other end was Alec and I was sent training with the kids. Also that day the squad list was put up for the training camp in Denmark I think it was and I wasn’t even in the squad to travel. I went to see Aidy and asked why, when he could have let me go for ‘x’ amount of money, did he then not want to use me? If he didn’t want me I didn’t see the point in him keeping me. We were in that room for about an hour in total. In the end Alec got concussed and couldn’t make the tour. I was then told I was going and that gave me the chance to show what I was about. We had a shooting session and it was one of my best sessions ever. We then had a practice match after that and he swapped me and Loachy at half time and put me in the main team. We had a proper game the next day; he played me, we won 4-0 and I got man of the match. I went from training with the kids to playing every pre-season game including against Inter Milan and then in the very last week Ben Foster came in. So I went from being number four to a number two in the Premiership season. Where I have to give Aidy credit though is that although I was disappointed with some decisions and the way things went, he was always open minded and prepared to look at the situation. Hindsight is a wonderful thing, but looking back would you have gone to a Blackburn type club again to get the education or would you drop down to maybe a league one level team and get a full season? That’s a tough one to answer. There were a lot of positives to going, a huge one being the opportunity to work with Brad Friedel who I learned a lot from. It was good for personal growth as well as I had to move away from home. I didn’t particularly like living up north but doing that made me appreciate being closer to home, mainly for the weather! It always rains up there! That was the spell when I was trying to get back from injury though and maybe now I would be a bit more honest and say that I am not quite 100%, but I certainly don’t regret it. What would you say are your best and worst moments in a Watford shirt? After such a long time at the club it’s tough to pick one as there were so many great moments. There are several games that stand out such as my debut. Portsmouth and Southampton at home in that cup run were great nights. Man City away in the Premier League was great for me, as was playing up at Newcastle. St James Park is an amazing place to play. So there are a few that stand out. As for the worst moment it has to be the Hull game but luckily I got a bit of payback against them this season. I was having a good season and was skipper for a lot of the games and then in that Hull game I made one bad decision. It came at such a bad time as well as we were winning and we were on top. That mistake actually affected me mentally for a while. Do you think you would be number one now, or would have at least played more games for the club, if it wasn’t for that mistake in the Hull game? Maybe. I am quite heavily into psychology which helps as the highs and lows of a goalkeeper are unreal. But at the time people kept asking if I was ok and I just batted it away telling everyone that I was fine. It was only the next season that it hit me and I realised that I just wasn’t enjoying it. That led to another issue with Aidy as I went to see him and I was honest with him and told him I just wasn’t right to play at that time. He continued playing me and I think my performances showed that I just wasn’t right to play – it was probably the worst run of my life. It was strange as I put in two of my best performances. We played away at Southampton and we won 3-0 and I saved two penalties before half time, and following that we played Cardiff and I had a great game but I just knew I wasn’t right. I played the next game after that against Wolves and didn’t play particularly well and I went to see him after that. He actually came up to me and asked me what was wrong as he thought I didn’t seem right. I was honest and told him I just wasn’t enjoying it. I told him I didn’t know what was wrong with me, I wasn’t enjoying the game anymore and I wanted him to drop me. It bugged me that he wouldn’t concentrate on what I was saying and it was almost like we were having separate conversations. Looking back he was under pressure himself. Looking back now I was going into games not wanting to play and not even wanting to be there, I just couldn’t get my head right. I even remember the games. We played away at Preston when i made a mistake to my left, I then played probably my worst ever game for Watford at home to Blackpool which we lost 4-3 and turned out to be Aidy’s last game. After that Malky came in and he was good as he understood what I was saying. We then went down to play Swansea in a league and cup double header and we won the cup game 1-0. We then played up at Barnsley in what was effect my last league game but I put in a better performance there so I finished on a better note than I could have. When I got to Brentford that was when I knew I had to get myself right as I’m confident in my ability but I knew I had to get my head straight as if I had another period where my confidence dropped I am going to shoot myself in the foot again so that is why I have done a lot on the psychological side including hypnotherapy. I am at a stage now where I feel better than ever and I am enjoying it more than ever. As much as it is sad when someone loses their job we all know football is a cut throat business. After that Blackpool game on the Saturday Aidy left the club on the Monday. Was there any sense of relief when you heard he had left given your state at the time and the fact you were at loggerheads? I certainly wasn’t pleased to see him go. It’s difficult to remember how I felt at the time to be honest. I wasn’t feeling good on or off the pitch at the time so it was almost irrelevant to me. It’s hard to even recall what I felt about him going. In many ways because of my mind-set at the time that was the inspiration to setting up a couple of businesses outside the game as they acted as an escape from the game. So in answer to your question I think at the time I was quite indifferent about it. When you left in the summer to join Brentford did you leave on good terms? Yes I left on great terms. I have nothing but respect for Malky and even Aidy despite our ups and downs; he is a good person in essence. But certainly leaving when Malky was manager we left on great terms. I needed to leave as I was too comfortable really. That took some realisation as it was difficult to see. I was having a great time, I had known everybody for years and although I didn’t want to be a number two there is no doubting that it is the easiest life in the world. There is no real pressure on you and I knew that when I needed to play for cup games or as cover I knew I could step in and do a job quite comfortably. Equally the club were giving me contracts year on year which was fine. But then I started to think about it more and I realised I was never going to push on there and end up playing hundreds and hundreds of games similar to the likes of Alec has done. In January I went to see Malky and asked if I was going to get a contract for the following year as I was a bit worried about going into the last six months of my contact as then I was only one injury from being out of the game. He told me I would get a new contract but it wasn’t showing just then. I had a couple of clubs come in for me on loan in Wycombe and Brentford and they turned them down. I wanted to go on loan and suggested the club allow me and just put a 24 hour recall on me so that I could then get some football and the opportunity to get in the window a little bit. It disappointed me a bit that they wouldn’t sort the contract out then and they wouldn’t let me go out on loan. In the end they did offer the contract at the end of April, it was one year again and it was a 30% reduction. I couldn’t understand why it couldn’t get offered back in January even with the reduction so at least I knew what it was going to be. I was open and honest and what I would have liked is to have had the offer on the table and then if an offer came in then I would tell the club about it and until then I would be the perfect pro. They did put a deadline on the deal but I kept pushing it as I was hearing rumours of clubs coming in. Wycombe came in for me again but to be honest I didn’t want to drop down to league two. I then spoke to a friend who plays for Brentford, David Hunt, and I told him what I was on. He forwarded it on to the manager and they came in with an offer. I met with the manager and he offered a two year deal but more importantly he told me I was going to play games for them and that they were a club on the move. I weighed up the offers and with the affinity I had with Watford and being close to a testimonial season it was difficult to leave. I was comfortable at Watford but I knew I had to do it. Without asking specifically how did Brentford’s offer stack against Watford’s financially? It was a further cut for me. I worked out that if I stayed at Watford and just sat on the bench all season picking up that appearance money then I would have been far better off with that compared to what I am earning at Brentford. But the decision was based around the fact that I am 28 now and I want to play a good number of games in my career and get a few more highlights which I have done already this season. Also the two year deal was important. Two years running at Watford I had got towards the end of the season about to be out of contract and I didn’t like that, it made me uncomfortable. You never play thinking about injury but it’s never far from your mind especially as I have had a couple of serious injuries before, so it only takes one bad injury at the wrong time and I will be off looking for a job. Is it fair to say it is more difficult for keepers due to the numbers needed per squad? You will tend to see forwards and midfielders maybe dropping a division to play but sometimes you see keepers just disappear. Yes it is more difficult. Strikers and midfielders will always get a move as any manager will always look for good cover in those positions and also to try and freshen things up throughout a season. However once a season starts clubs tend to have goalkeepers in place and they will stick with that plan for the entire season. Some of the lower league clubs don’t even carry a sub keeper now and are of the opinion that if the number one gets injured then they will loan someone in, so for a keeper they can drop out of the league very quickly. It is widely known you have several business interests outside of the game. Do you feel these have helped, hindered or been indifferent to your football career? I was quite careful in the way I set them up. The first business, the head wear one, I have gone in 50/50 with a friend and he is the one pushing it. We had a shop in Leicester that he was running and he picked up a salary for that. So although we are 50/50 my involvement was as much or as little as I wanted it to be. I didn’t want it to be a situation where I would get home from training and then be on the computer for hours on end. The goalkeeping one, GK Icon, is slightly different. I have written all the content for the site, the session plans and the idea behind it and I did all that in my spare time which was quite enjoyable for me. I then went about getting investment for it and got help from someone who could push it forward, so my involvement fits around me and there is somebody else who does more of the legwork. We’ve got 18 schools now around the country and we are now starting to branch off with franchises and what have you. It’s a good one because it uses what I know and what I am passionate about, and I’m grateful to the likes of Ben as he has put his name to it and is happy to endorse it. It’s good that I know the likes of Ben and through him I know Joe Hart and despite not being on the sort of money those guys are on this is important for my future. Are they sustainable businesses or have you had to put a lot in? I did into Dr Cap but that is now about to be profitable after three years trading. We have changed that model a lot and it’s now online only which I think is the way of the world. With GK Icon we are just coming to the end of our first year and we will have made a loss on that but if the growth continues at its current rate then we are not going to be far off breaking even in year two. Did you get the investment from Dragon’s Den? No we didn’t in the end. We did on the programme but then in the weeks and months following that it didn’t work out. When the time comes to hang up your gloves will you look to have more involvement with these businesses? 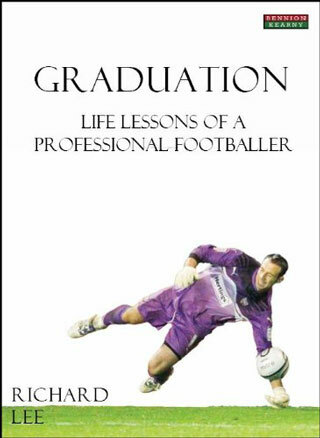 Something I am just getting involved in now, and it is thanks to football I have found this, is personal growth, psychology and NLP. Keith Mincher who came in with Aidy was a big influence on me – I still speak to him now. I have Wednesdays off and I am now booked in every Wednesday between now and May to go into local schools and talk about goal setting and motivation. So I want to go down that path a bit more as it is something I know a lot on so I hope to get into that a lot more. Are you not tempted to follow in Chamberlains footsteps and coach at a club? Maybe. I don’t know really so I will just have to see where I am at with it. I did have a joke with Lloyd that me and him will go for the Watford manager’s job one day. Lloyd can do the reserves! I enjoy the coaching I have done with GK Icon with younger lads and there is also a young keeper at Brentford that I work closely with and I really do enjoy that side of things. So I would love to help coaching with goalkeepers but maybe not specifically just at one club. You have come right through the ranks with Lloyd and you were sitting on the bench when it happened; what was your first thought when you saw he had scored? It was hilarious! We all ran on the pitch celebrating. It was a normal celebration from the fans then there seemed to be a moment of realisation it was him and the celebration just continued and continued – it was mad. He will get another this season I think, he’s getting closer! You reckon?! I’ll be amazed if he does! What have you made of Watford this season? It was great to come back and watch them the other week when I was a guest, and me and the other lads at Brentford watched the game against QPR on the telly. I still text a few of the lads after every game and I meet up for dinner quite often with the likes of Lloyd and Aidy Mariappa. Huge credit has to go to Malky; he has a real eye for a player. The other thing that I have probably noticed more since I left Watford is that the setup is so professional. With restricted finances they really do make the most of what they’ve got and they are very tuned in with the scientific part of the game and getting the lads right for the game. Malky is a manager that you want to play for as well, he is very likeable and you can see that the lads want to play for hm. The few games I have watched they have looked fantastic and they are surpassing all expectations. They are an outside bet this season I think. I think a lot of this season’s success is down to youth. Because they are so young when they win they will just keep going and win a few on the bounce, but as a fan there is a nervousness that all of a sudden we will have a shocker and maybe get soundly beaten and then find ourselves in a position where we can’t buy a win. I think that could have been a problem but Malky has got the blend right as the experienced heads they have got in the team are very experienced ones such as Tiny and Eusty. I think that’s key. If it was a team of 11 young lads then you could be right with your concerns but you should also remember that they are generally very confident lads. You hear any player talking about their squad and they will say that there is a good team spirit and that it is a tight group etc. but with the lads at Watford they genuinely are a very tight knit bunch of lads. They go out together and they do get on very well. Take someone like Mariappa; he probably doesn’t get the credit he deserves but he is such a good role model and is such a good, bubbly bloke to have around the place. In years gone by, and I won’t names name’s, you could always get maybe a bit of whispering in the dressing rooms and people talking behind each others backs. That has happened before but certainly not in the recent time I was there under Malky. What did you make of Brendan Rodgers? I actually got on great with Brendan. I know the majority of Watford fans don’t hold him in particularly high regard and don’t appreciate the way he finished things there but for me on a personal level he was great. He came in, saw me train and pulled me to one side. He was honest and told me that he saw me as a number two but that I played an important role around the club and he valued what I brought to the club. He was open and that will always help a manager. It was a shame the way he left. My guess is that Reading came in and probably offered him a lot more money and he already had that connection with the club, it’s just s shame that he said what he did. Out of interest, as a player how do you end up knowing that it was that one comment that made the Watford fans so angry? I was unaware at first but I had my blog online then and I remember doing a piece on it then and basically just wishing him luck. Following that I then got a lot of abuse personally and that was when I found out what he had said. He should have said nothing or held his hands up and said he didn’t know what would happen. I’m sure he looks back now and regrets what he said. Just time. I had so many other things going on it was impossible to do but I do have little video snippets and journals on the GK Icon website now instead. What was your nickname and why? Erm..ha ha! There was one nickname but that was to do with the showers! Dirk Diggler! Are you any good at table tennis? There is a massive thing with that at the training ground, they take it very seriously. I never even entered; they are very good at it so I stayed well clear! I saw Danny Graham’s tweet that he won the competition, fair play to him. You played under Brendan, Aidy, Ray and Malky – all very different characters. I was very grateful to all of them and of course to GT who gave me my first contract. I was also grateful to Hitchy as he pushed for me and was making noises about me to the manager. Ray gave me a chance early on. Quite often I have had the height thing thrown at me as I am 6′ which doesn’t seem to be tall enough in some people eyes, people expect you to be 6’2″ or 6’3″ but I don’t see it as an issue myself as I think positioning is more important. Somebody showed me a stat the other day that I have come for more crosses than anyone else in the league. Quite often I will gamble that a player won’t smash it near post as they are not trained to do that. I am a bit of a geek when it comes to goalkeeping as I do believe there is an optimum position to be in. I study and watch games closely and so because of knowing when to go for a cross and when to not go I very rarely go for a cross and get beaten to it. As a match goalkeeper my record is good. This season I think my record is 12 conceded in 17 games. It does bug me when you see a giant keeper then stay on their line. Sorry I’ll get off my soapbox now! Ray made me feel like number one for the first time and I really liked Ray, I was genuinely sad to see him go as he had done a great job for Watford at the time especially with the shoestring he had to work with. I enjoyed playing under all the managers though, they all brought something different to the club and were enjoyable to work under. Who is the best player you have played with for Watford? Youngy has gone on to good things and I have a lot of time for him. After not getting a deal and not giving up he was really determined. My lasting memory of Youngy was that after every session he would stay out hitting free kick after free kick. Marlon was a great finisher, he had this knack of drilling it in the bottom right hand corner – he was so good at it. If I had to pick one though I would have to say Youngy. Who is the best keeper playing in England? Tough question. My ultimate role model is Iker Casilla’s because he is so quick and powerful and he isn’t the biggest. In England though I like Reina, his distribution is fantastic. Without being flamboyant though the best in England is Van Der Sar, he is so consistent and played at the top level for so many years. What striker is the toughest you have come up against? I have played against United three times and Rooney and Ronaldo together were incredible and both scored a couple past me. Doyley also scored past me up there as well with a bullet header! If I had to choose one though it would be Rooney although recently his form isn’t what it was at the moment.